German wines just do not get the respect they deserve. Germany is an exciting, stimulating wine producing country, yet so many people – in the UK anyway – have a very limited view of what German wines are all about. The folk memory of cheap German wines of the 19760s and ’70s lingers on in the UK to everyone’s detriment. You can still buy those sweetish wines like Liebfraumilch, but you have to look for them. Leave them to your memories though and try some of the more interesting and exciting German wines that are now being made. A few months ago I had an amazing trip to Germany, to some of the lesser known regions – lesser known from a UK perspective anyway – Württemberg, Franken and Baden. I loved it so much and was so impressed that I recently put on a tasting of some fantastic German wines that I discovered on that trip and at some subsequent tastings. Many of these producers are member of The Verband Deutscher Prädikatsweingüter (the Association of German Prädikat Wine Estates, abbreviated VDP). This a voluntary grouping of some quality conscious producers nationwide who have grouped together to apply higher winemaking standards than the national regulations require. VDP Grosse Lage is roughly the equivalent of Grand Cru and come from sites carefully selected and classified by the VDP. Yields must be very low, harvesting must be by hand and the grapes must be at least ripe enough ripe enough to qualify for Spätlese level. A dry wine from a Grosse Lage site must be labelled as Grosses Gewächs and bottled in a special bottled marked with GG. Dry examples must be labelled as Qualitätswein Trocken. Off dry versions can be labelled as halbtrocken or feinherb, but these terms do not have to be on the label. 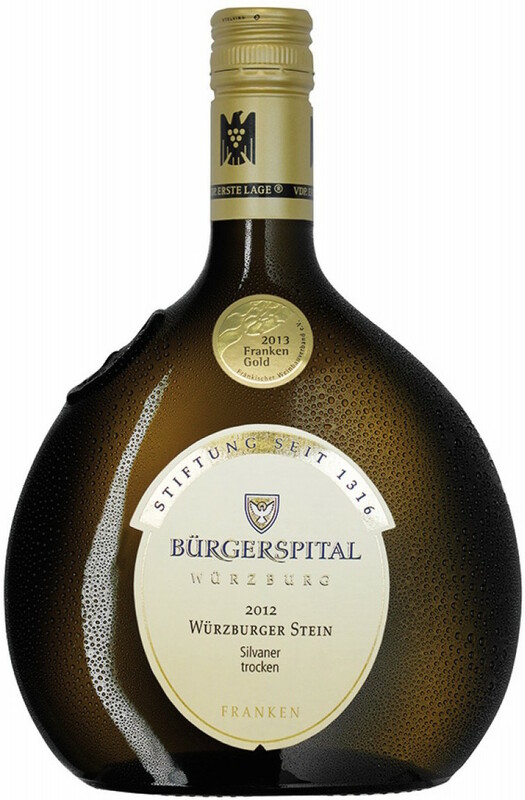 The label must bear the name of the village and the vineyard site, like the Würzburger Stein Silvaner Trocken below. VDP Erste Lage means first class vineyards and are supposed to have a distinctive character, much like Premier Cru vineyards in France. Yields have to be low and the grapes must be harvested by hand and must be at least ripe enough to qualify for Spätlese level. Dry examples must be labelled as Qualitätswein Trocken. Off dry versions can be labelled as halbtrocken or feinherb, but these terms do not have to be on the label. The label must bear the name of the village and the vineyard site, like the Würzburger Stein Silvaner Trocken below. Sweet versions are labelled with one of the traditional Prädikats (Kabinett, Spätlese, Auslese, Beerenauslese, Eiswein or Trockenbeerenauslese), provided they qualify for that specific Prädikat. VDP Gutswein is like a regional wine – like AC Bordeaux or Bourgogne – they can have the specific Prädikat on the label, if they qualify and Gutswein does not have to appear on the label. 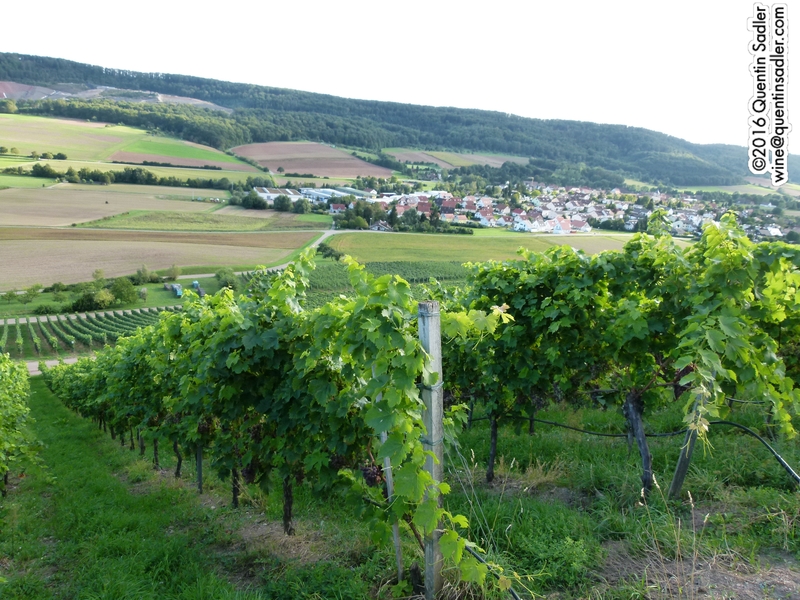 Württemberg is a wonderful wine region, ridiculously beautiful and full of stunning traditional towns and vineyard sites that take your breathe away. Many of these are either on slopes by the rivers, especially the Neckar, or on a scattering of south facing hillsides to the north and east of Stuttgart. Because of the excellent exposure it is the premier red wine region in Germany growing Lemberger, or Blaufränkisch, Trollinger, Spätburgunder, Dornfelder and Portugieser among others. 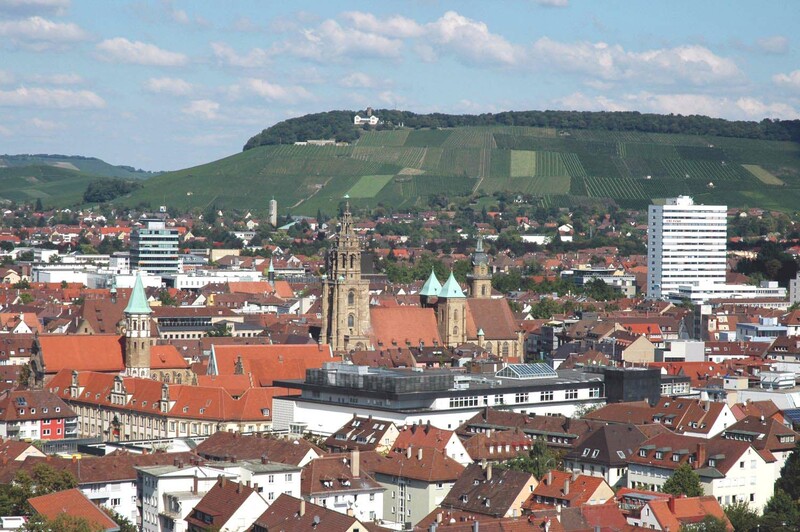 Heilbronn with the vine covered slopes all round. Like many of the producers I showed, the Hengerer family have been growing grapes and making wine since the fifteenth century. 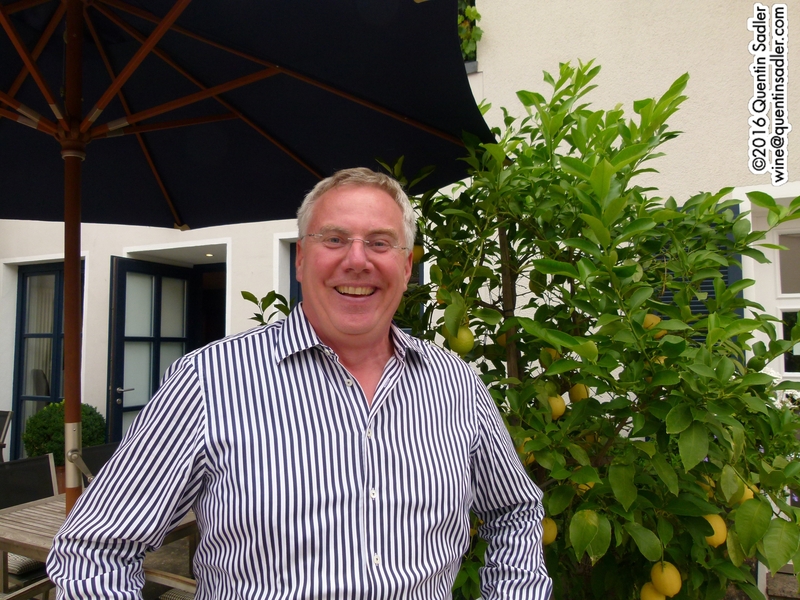 The estate, weingut in German, is run by a very talented winemaker called Hans Hengerer and he is really good. They are based in Heilbronn Again like many of these producers he has a small estate, just 12 hectares, but he makes terrific wines form it, using old vines and wild yeast fermentations. This is very unlike my normal view of German Riesling, it is properly dry and the wild yeast and malolactic fermentation and lees ageing give it a fat, textured style that is backed up by, rather than dominated by, Riesling’s hallmark acidity. Lovely length and finesse, this is a beautiful wine – 93/100 points. This wine really made me sit up and take notice. Hans Hengerer has done something amazing here, he has made a dry Muscat that I really love. I think what sets it apart if that it is made from the Yellow Muscat rather than the more famous White Muscat, or Muscat Ottonel, and it has loads of character. The aromas are simply stunning, lifted and peachy with some wonderful peach blossom and roses fragrance too. The palate carries on the delights with a touch of rich, peachy acidity, loads of ripe fruit and some lightly creamy texture from the lees ageing. A very unusual style for me and I totally fell for its charms and think it would make a superb aperitif or partner to fine Asian cuisine – 92/100 points. Franken is another scattered wine region that consists of steep hillsides bordering the Main River. The summers are short and autumns are pretty cool, so early ripening grapes are the most suitable, which is why Riesling is not widely grown, instead the signature grape is Silvaner. Many wines are bottled in the traditional flask shaped Bocksbeutel, which has been used in the region ever since glass bottles became normal in the 17th century onwards. The Marienberg Castle above Würzburg. 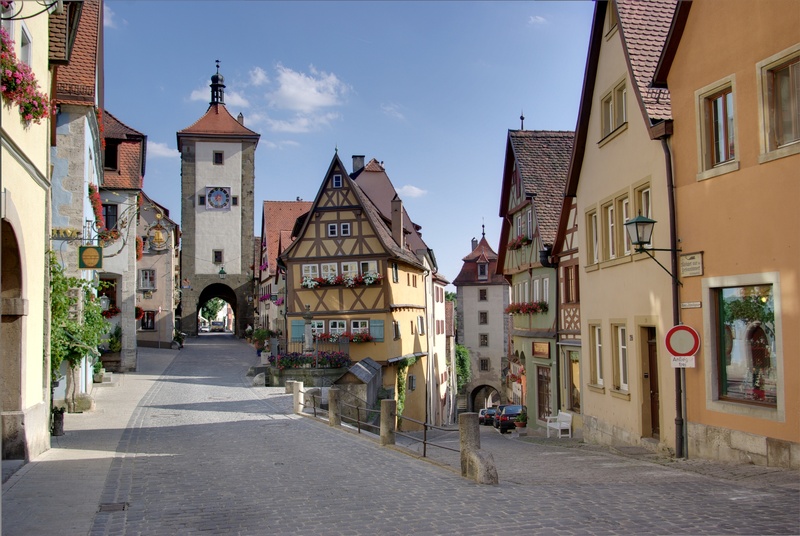 The gorgeous chocolate-box town of Rothenburg ob der Tauber, 30 km south east of Würzburg. 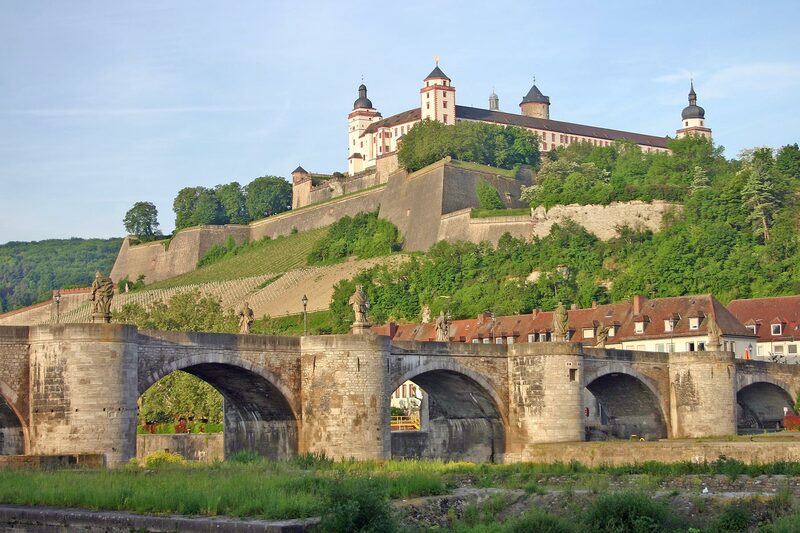 The Weingut Bürgerspital was originally created in 1321 to fund an old people’s nursing home, Bürgerspital, at the gates of the beautiful town of Würzburg, which has an amazing castle nestled amongst the vine covered slopes above it. In the past I never thought much of Silvaner, especially from Alsace, but having now tasted quite a few examples from Franken, I am much more excited by the grape than I ever thought possible. This example comes from one of the most famous vineyards in the region, Stein, which is a steeply sloped site with poor, stony soils. The wine it makes is taut, bone dry and mineral in a very Chablis-like way. The wine aged for several months on the lees in big old wooden barrels and the extra complexity shows. I loved this wine, it was a splendid aperitif and the left overs were fabulous with fish and chips the next day – 93/100 points. 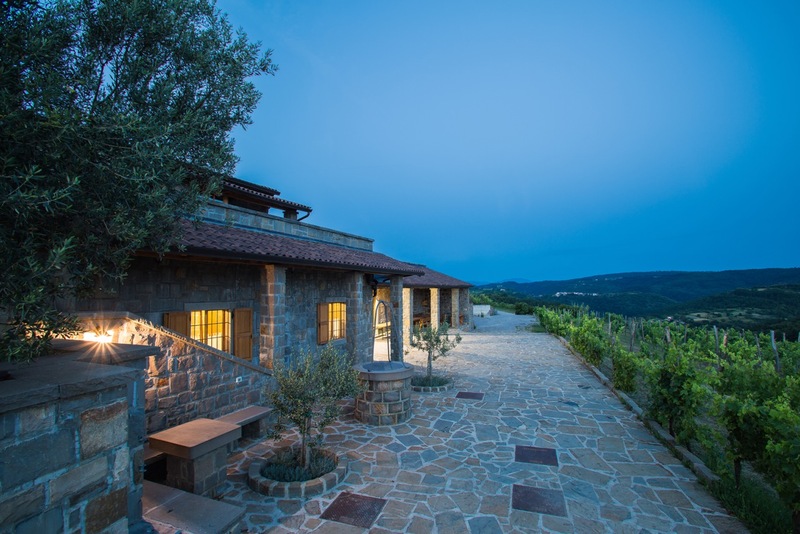 Wittman’s south west facing slopes capture the afternoon sun – photo courtesy of the winery. 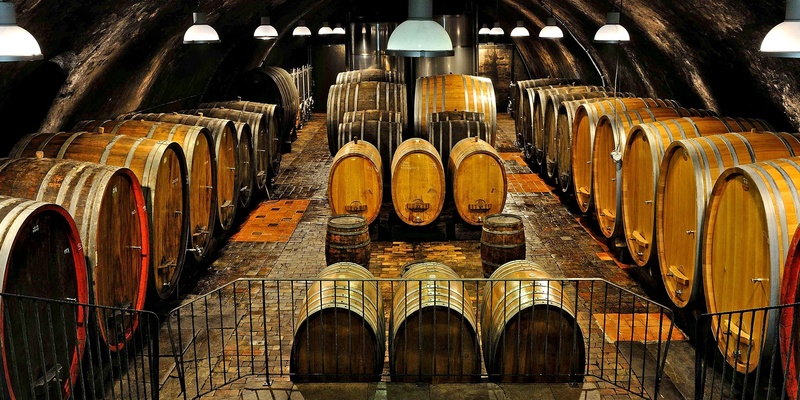 Wittman’s magnificent cellar – photo courtesy of the winery. This wine isn’t really from an unusual place, but I enjoyed its style very much, so I stuck it in the tasting. Grauer Burgunder is another grape variety more commonly associated with Alsace, as it is Pinot Gris. The Germans can also call it Rülander, although if that is on the label it is often a tad sweet, and Pinot Grigio has become widely seen on the cheaper, lighter versions. Weingut Wittman is another venerable estate, having been making wine in the beautiful old market town of Westhofen in southern Rheinhessen since 1663. Today Philipp Wittman organically and biodynamically farms 28 hectares – 69 acres – of fertile soil and grows mainly Riesling, but good as his Rieslings are, this wine really drew me. He carries out slow fermentations and uses wild yeast, so his wines have a lot of texture and that and the aromatics is where this wine really wins. The nose was leesy and creamy with some smoke and rich orchard fruit too, especially spiced pear. The palate was textured, creamy again, but there was good acid balance for a Pinot Gris. It was quite rich and powerful and definitely made a statement, I loved it – 90/100 points. Sachsen is a wine region around near Meißen and just to the north west of Dresden. 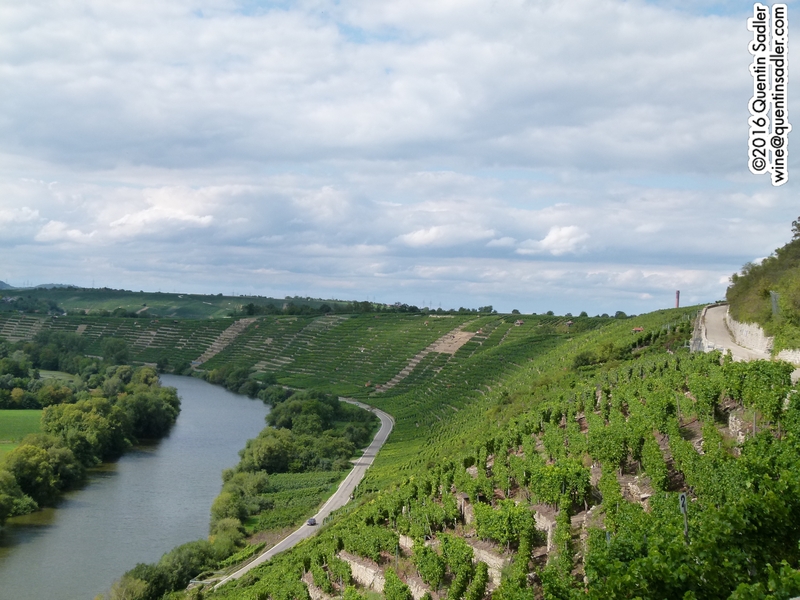 We are quite a long way north here and so most of the vineyards are planted on very steep slopes along the Elbe River in order to get enough sunshine to ripen the grapes – the Czech border is not far away either, so it is easy to forget that this is wine country. 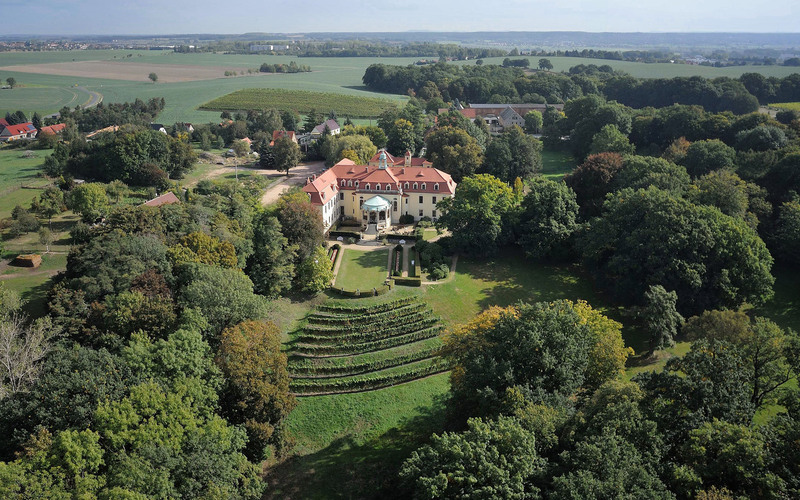 Schloss Proschwitz, the castle is also a hotel and restaurant – photo courtesy of the winery. 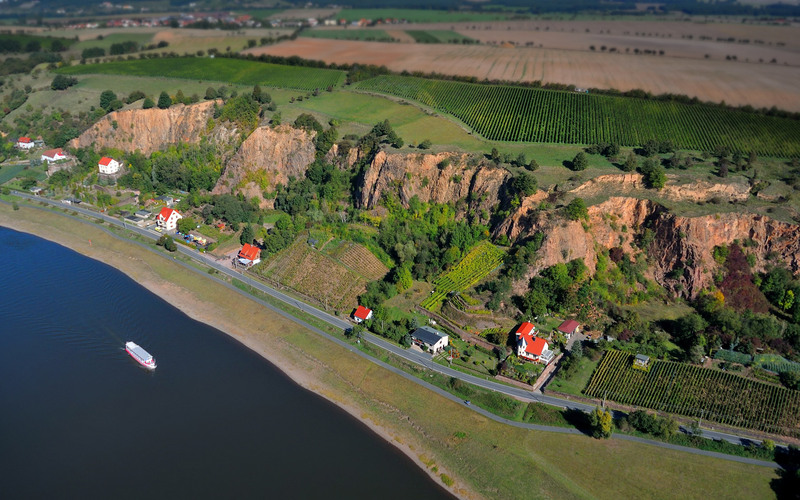 Schloss Proschwitz vineyards on the bank of the Elbe River – photo courtesy of the winery. I love this wine and if you are interested you can click here to read a piece I wrote in 2009 about how I became aware of it. Scheurebe is a terrific grape that was created by Dr. Georg Scheu in 1916. He thought he was crossing Riesling with Silvaner, to produce a superior Silvaner, but it now seems that he made a mistake and actually crossed Riesling with an unknown wild vine that has been lost to science. Until 1945 the grape was known by the serial number that Scheu had given it, Sämling 88, or Seedling 88, and it is still called Sämling or Sämling 88 in Austria. In 1945 it was named Scheurebe in Scheu’s honour. Schloss Proschwitz is in the old DDR, eastern Germany, and is owned by Georg Prinz zur Lippe, whose family had their lands confiscated by the occupying Soviet forces in 1945. After Reunification Georg was able to slowly buy back his family’s wine estates and is today a beacon for wine quality in this sadly overlooked wine region. The nose was fragrant, with citrus and peach blossom, with some ripe nectarine and some honeyed, waxy development notes. The palate was slightly rounded and textured – malolactic and lees perhaps – with some lovely orchard fruit, dashes of honey and white pepper. As well as that softness, there is an underlying core of acidity and minerality keeping the whole thing refreshing and fine – 92/100 points. Sonnenhof in the late afternoon. Looking south from the Sonnenhof at dusk. I saw so many stunning vineyards in Württemberg that it was easy to become quite blasé about the beauty all around me, but sitting tasting wines in the vineyards at Weingut Sonnenhof was quite an experience and explained why the site is called Sonnenhof, or sun yard – even halo in some translations. It is a wondrously sunny spot on a south facing ridge halfway between Stuttgart and Heilbronn and completely lived up to its name. Interestingly the whites from the estate were really pretty rich because of all the sun and heat and it was the reds that really appealed to me here, although their barrique aged Chardonnay was pretty good. Lemberger, or Blaufränkisch which means Blue Wine of Franconia, is the central European black grape par excellence and it’s found all over Germany, Austria, Hungary, where it is called Kékfrankos, and Slovenia, where it is often called Modra Frankinja, as well as Slovakia – it is also an important grape in upstate New York, where it is also known as Lemberger. There is actually a small town called Lemberg – Lemberg pri Šmarju – in Slovenia’s Lower Styria region and some sources say it was from there that the grape was exported to Germany in the nineteenth century and hence the reason for the Lemberg name there and in the USA – although of course the area was part of Austria at that time. This wine is called Hades because it comes from the warmest, sunniest blocks on the estate. It is a careful selection of the best fruit and is aged for 20 months in oak barrels. The colour is amazing, dense and opaque with a deep black cherry colour. Black cherry, blackberry, plums, spice and a little tobacco and mocha dominate the nose, while the palate is rounded, smooth and seductive. There are mouth filling, concentrated dark fruit characters, together with some of the acidity of dark cherries and stewed plums, while the oak gives the complexity of cigars, mocha, fine milk chocolate and graphite. There is some nice freshness and appealing fine grain tannins on the long finish. I was very impressed by this wine and enjoyed it immensely – 92/100 points. 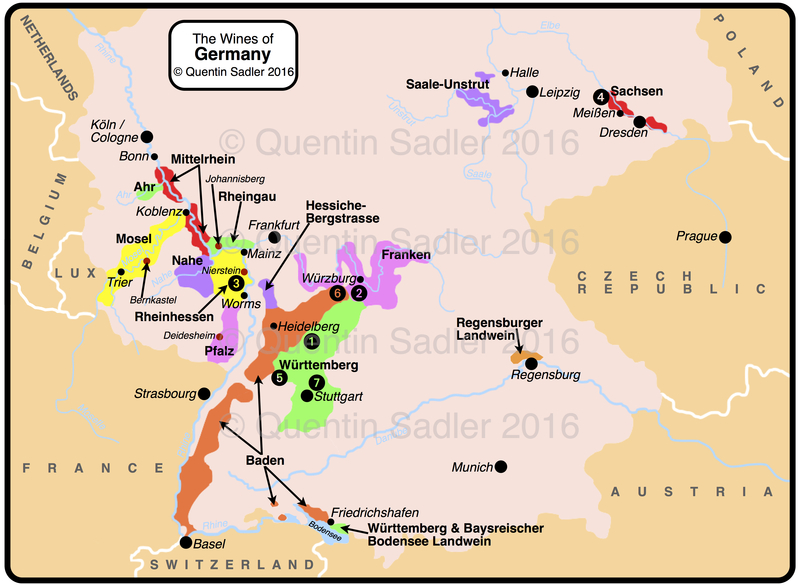 Baden is a very hard wine region to pin down, because it is so spread out, but the next two wines come from the Tauberfranken, which is in the north east of the region where Baden and Württemberg meet. 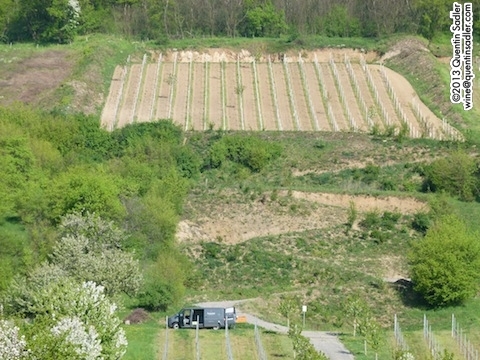 The Reicholzheimer First vineyard at Weingut Schlör, from below – photo courtesy of the winery. The Schlör family have been making wine for well over 300 years, but Weingut Schlör was created in 1984 by a charming couple called Konrad and Monika Schlör, and as far as I can see they do everything. This wine is made from Schwarzriesling, which is the local name for Pinot Meunier, which is a common grape in these parts, although few that I tried had the depth of the examples made by Schlör. The grapes were handpicked and carefully selected, cold fermented and then matured in French oak casks for 8 months. The wine is a lovely Pinot colour, with a fragrance and perfume that is very enticing, there is a leafy, lightly spicy quality and savoury scented red fruit. The palate is medium bodied and has that spicy, earthy quality and lovely ripe red fruit, smooth tannins and that spice character. I loved this wine and would serve it lightly chilled I think – 92/100 points. 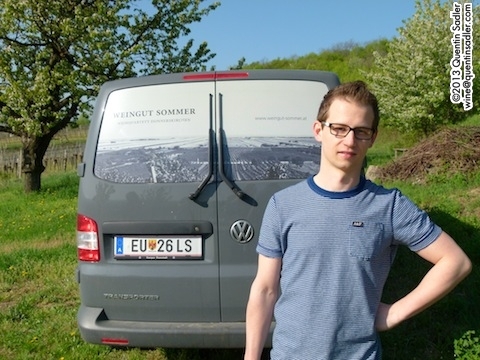 Konrad Schlör working in his beloved vines at Weingut Schlör – photo courtesy of the winery. This is a single vineyard wine from Reicholzheimer, Reicholzheimer First which is very near Wertheim on an S shaped bend in the Tauber River. The steep vineyard faces south west, so gets perfect exposure. 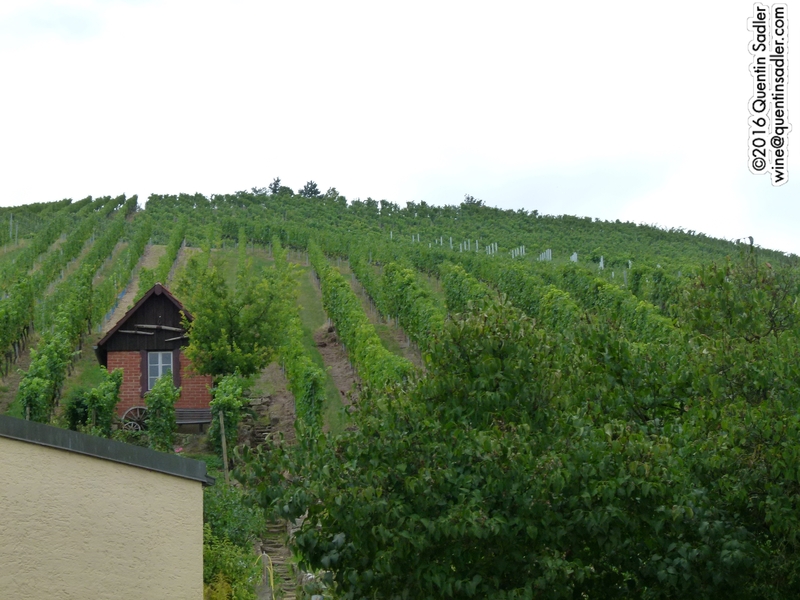 The site is an Erste Lange, Weingut Schlör is the only VDP member in the Tauber Valley and this is the only rated vineyard. Interestingly the First vineyard appears on maps from 1476 onwards – it was then spelt Fyerst – and was next to the Bronnbach Monastery, which was founded by Cistercians monks from Burgundy, who by creating monasteries across Europe, did much to spread skilful viticulture too. The fruit was handpicked and only the wild yeast was used for the fermentation, which gives a longer, slower fermentation. After a cold fermentation, the wine was aged in French oak barrels for 18 months. This wine is more complex and concentrated, with a richly smoky nose. On the palate the tannins are velvety and the spicy, smoky oak and rich dark red fruit are really well integrated. I think this wine needs time to show its best, but it was tremendous right now too – 93/100 points. 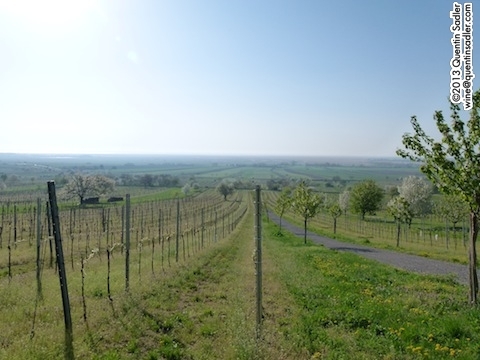 The Untertürkheimer Herzogenberg vineyard at Weingut Wöhrwag. Weingut Wöhrwag was one of my favourite visits on my trip, they were lovely people and all the wines were magnificent – I loved his Rieslings. The winery and the Untertürkheimer Herzogenberg vineyard are in a suburb of Stuttgart just to the the north east of the city – there is an U Bahn station just a short stroll away from the vines. 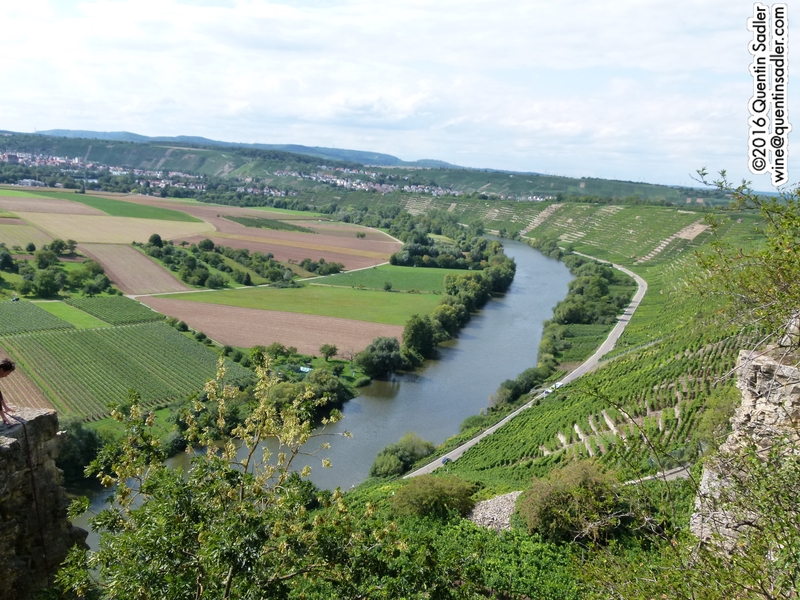 The vineyard itself is a magnificent site, a steep hill whose south and south west facing slopes overlook the Neckar River. I had never heard of Wöhrwag before, which is hardly surprising as they have a strong local following. 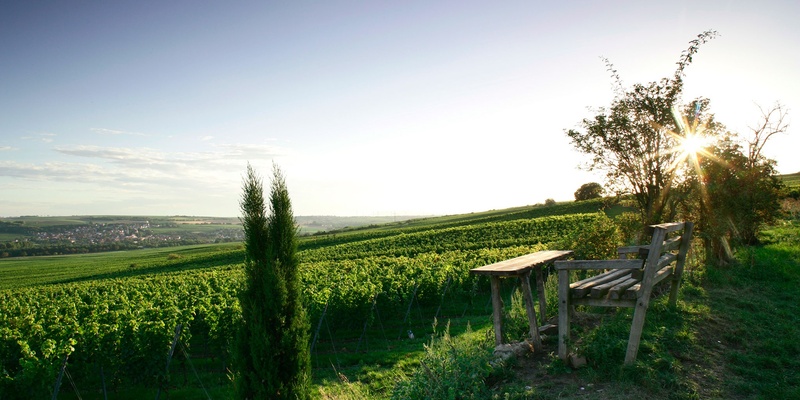 50% of their production is sold at the winery and the rest within 60 kilometres – mainly in Stuttgart. 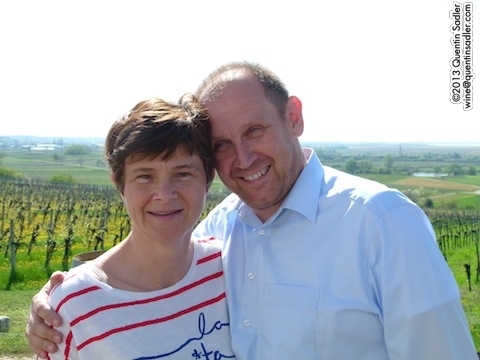 Hans-Peter Wöhrwag and his wife Christin farm the 20 hectares of the Untertürkheimer Herzogenberg – it is a monopoly – vineyard using sustainable viticulture. They do not irrigate as they want the vines to dig deep into the ground for water and complexity. For Hans-Peter everything is decided in the vineyard as the quality of the wine is all about the quality of the grapes. This wine has a lovely colour, rich medium ruby cherry sort of hue. 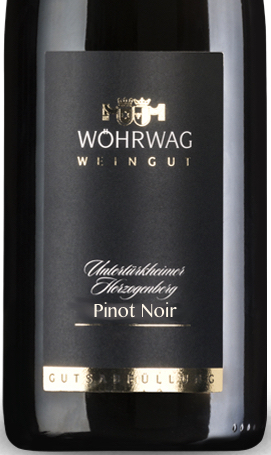 The nose offers great aromas of smoke and red fruit, earthy mushrooms and fragrant wild raspberry. The palate has a beautiful texture, silky smooth – just some fine tannins – with sweet red fruit, raspberry, rich, concentrated fruit and great finesse. Superb balance, great concentration, silky mouthfeel and mouth filling flavour, I found this superb wine to be lingering and seductive and I wish I had more – 94/100 points. More of the beautiful Neckar Valley. So you see, Germany has a lot more to offer than many people think. Great wines, wonderful variety and stunning scenery – I feel another trip coming on. Really though, if you have never tried a fine, dry German wine, there has never been a better time to give it a go as a German wine revolution is in full swing and the wines have never looked better. You probably won’t find these exact wines – unless you go to Germany – but a little time spent on Google will find you wine merchants with good German lists, or you could always start at The Wine Barn, which is a German specialist merchant and wine club. More information is available from Wines of Germany (UK) and Wines of Germany (USA). Dobrovo perched on top of a terraced vineyard slope in Brda, Slovenia. I really like going to Slovenia, it’s a beautiful country with lots of different landscapes and influences. The people are charming and the food and wine are terrific. I wrote about a recent trip here. Firstly let’s clear up a couple of misconceptions about Slovenia. It is not the same place as Slovakia, formerly part of Czechoslovakia. No that, much larger country is to the north and east of Austria, whereas Slovenia is to Austria’s south. Also Slovenia is not part of the Balkans and they will not thank you for thinking that it is. To the Slovenians the Balkans start further south and east. Slovenia is a tiny country, at 8,000 square miles it is slightly smaller than Wales and New Jersey, but with only just over 2 million inhabitants it is less populous than either of those. Indeed as the capital city, Ljubljana, only has around 280,000 inhabitants, it cannot even claim to be the largest Slovenian city in the world – strangely it seems that honour is held by Cleveland, Ohio – depending on your definition of a Slovenian of course. Slovenia enjoys a continental climate, 46˚ north runs through the country, just to the south of Ljubljana, and if you look around the world at all the wine regions that are situated at between 45˚ and 46˚ north, it will certainly make you salivate. As you might imagine, the coastal zone also has a Mediterranean influence to its climate. Historically Slovenia was past of the Austro-Hungarian Empire, when it was part of Austria, and then Yugoslavia. Before that it was the border area between the Western and Eastern Roman Empires and even today it is a link between the East and the West, Germanic cultures to the north, Romanesque cultures to the west and Slavic to the east and south. All of which helps to explain the wonderful variety you find in the country. Germanic, Hungarian, Italian and Slavic influences can be found in the different parts of the country, making touring it an exciting experience – like travelling around Europe in miniature. All of this effects the wines too, as you might expect. 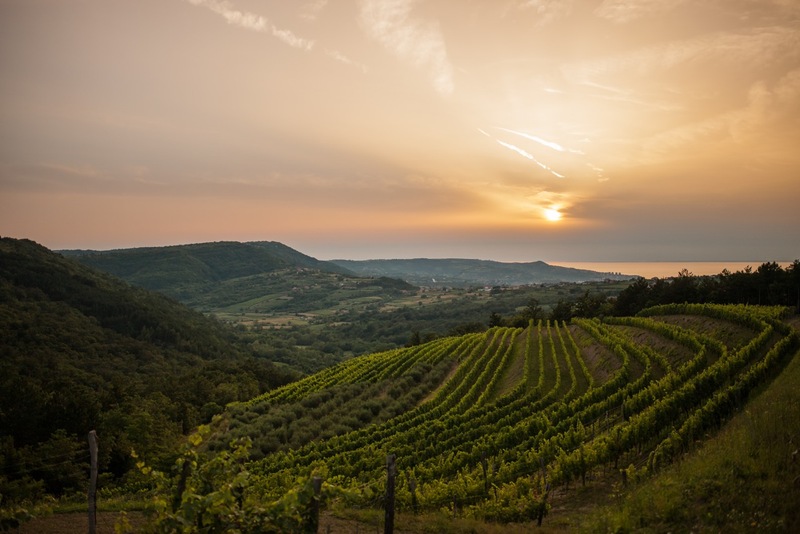 Those from the Istrian coastline often have an Italian and Mediterranean feel to them, while the wines of North Eastern Slovenia have a feel of Austrian purity about them. Recently I have put on some very well received Slovenian tastings, so I thought that I would tell you about them as I really want more people to discover the delights of Slovenian wine. Wine map of Slovenia – click for a larger view. 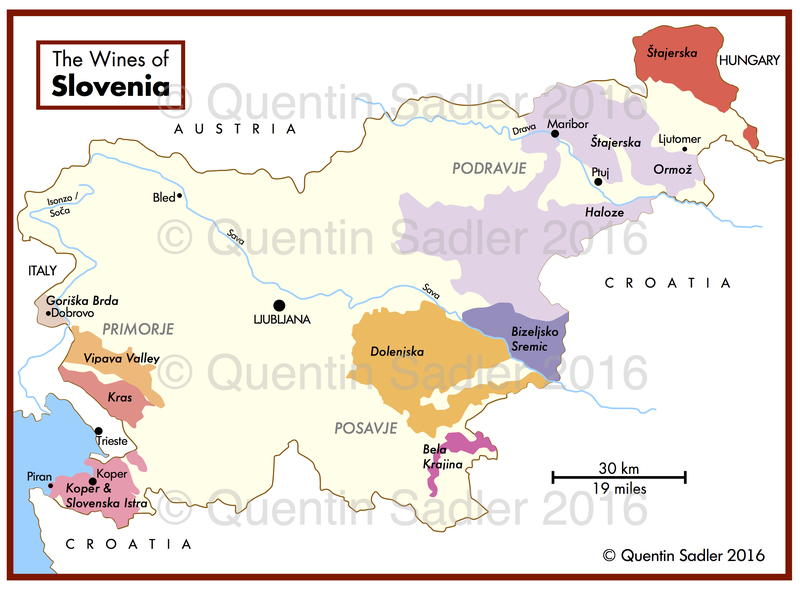 Slovenia has three main wine regions, Primorska, Posavje, and Podravje, which are then divided into districts. Podravje is in the north east of the country, it borders Austria and Hungary and includes the important districts of Jeruzalem-Ormož and Ptuj. 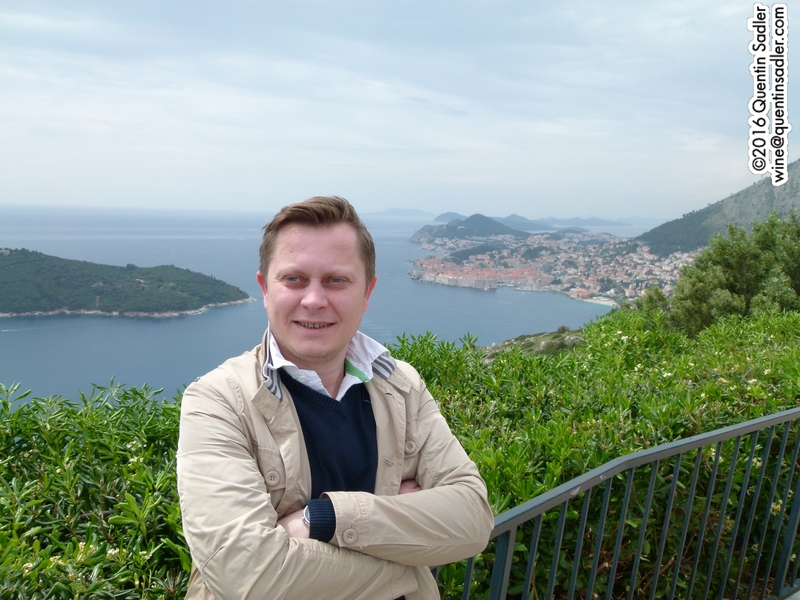 Posavje is in the south east and borders Croatia – I have not shown any wines from there. Primorje means coastal or littoral and incorporates all the districts near the sea and the Italian border in the west of Slovenia. This region includes the districts of Goriška Brda / Brda, Vipavska Dolina / Vipava Valley and Kras. My first two wines come from Puklavec & Friends. The Puklavec family had been growing grapes and making wine since at least the 1930s and Martin Puklavec ran the cooperative in Jeruzalem-Ormož from the 1930s to the 1950s. The family had lost their vineyards over the years and in 2008 decided to buy back the old family estates and to get back into the wine business. They have done so in a very clever and focussed way. They make clean, well made, international wines that have wide appeal and so are readily available, even in the unadventurous UK, they also make Tesco Finest Slovenian Sauvignon Blanc-Furmint, which is also very drinkable. 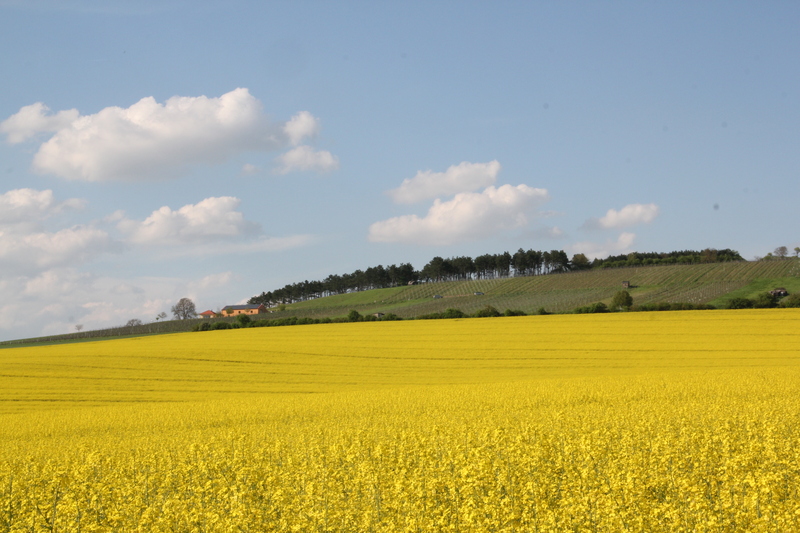 Jeruzalem-Ormož is a beautiful place of rolling hills between the Drava and Mura rivers. The rivers temper the heat, as do cool winds from the north, which makes it perfect for fresh, ripe and balanced white wines. A light fresh, easy drinking white with just 10.5% alcohol. It’s bright, grassy, floral and fruity with a light touch of the tropical about it and it gives plenty of uncomplicated pleasure – 84/100 points. Available in the UK for £7.99 a bottle from Waitrose Cellar. I love Furmint, it’s a classic Hungarian grape where it famously makes the sweet wines of Tokaji as well as some very exciting dry whites. The grape is widely grown in eastern Slovenia, where it is used to make dry white wines and is traditionally called Šipon. This wine is a little more complex and has a lovely bright, floral aroma with fresh citrus and some richer herbal notes as well. The palate is a little broader with some apple as well as lemon, lime and a dash of orange and those herbs again. Lees ageing has given some body to the palate and there is a little touch of spice too. All in all an attractive and refreshing wine – 85/100 points. Available in the UK for £9.99 a bottle from Waitrose Cellar. Bojan Kobal, a photograph I took when we were both judging in Dubrovnik. The next two wines are made by Bojan Kobal, a friend of mine who is a very talented winemaker – not that I would say that to his face, obviously. He is a very nice fellow whose family have been involved in winemaking since 1931. 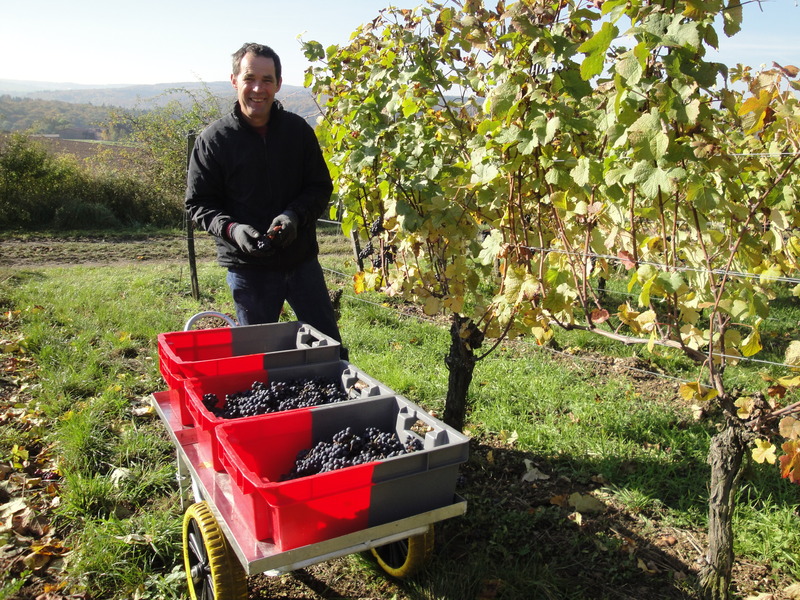 In fact Bojan grew up surrounded by vineyards and wine and went on to study oenology, which led on to a series of senior winemaking jobs to hone his craft before he returned to run the family estates. They are based in the Haloze district of Lower Styria / Štajerska, which is a stretch of hills along the banks of the Drava River near the charming city of Ptuj. The vineyards in this part of the world look gorgeous, as they grow grass between the rows to prevent soil erosion on the steep slopes. For some reason Bojan’s wines are not yet available in the UK, which is strange, because they are really very, very good. If any importers are reading this, do yourselves a favour and bring in Bojan’s wines. If you think you know Sauvignon Blanc, think again. This is an amazingly good take on the grape. Yes it is fresh, yes it is bright and has plenty of zing, but it isn’t a caricature of a wine as so many commercial Sauvignons can be. This is serious stuff with depth, concentration and richness as well as that lovely refreshing zing of acidity that Sauvignon does so well. There is grapefruit, mandarin, passionfruit and lime on the nose and palate, while the palate also has a lovely creamy texture from ageing on the lees. This is amazingly long and fine and carries its 14% alcohol effortlessly. If more Sauvignon tasted like this, I’d drink it! A great wine that really excited everyone at my tastings – 93/100 points. I like Blaufränkisch, it’s known as Lemberger in Germany and Kékfrankos in Hungary and in Slovenia it is more properly called Modra Frankinja, but I guess Blaufränkisch might be an easier sell. The grape is known sometimes as the Pinot Noir of the East, because it produces wines with similar weight to Pinot and that often have a similarly fragile quality. Despite being associated with Austria and Hungary more than anywhere else, the grape goes back to the time of Charlemagne, hence the Frankish part of the name. There is actually a small town called Lemberg – Lemberg pri Šmarju – in Lower Styria and some sources say it was from there that the grape was exported to Germany and hence the reason for the Lemberg name there and in the USA – although of course the area was part of Austria at that time. The nose is rich and enticing with ripe plum and earthy notes with a touch of spice and some leather showing development. The palate is soft and round with juicy fruit and smooth tannins giving a velvety texture. There are rich plum, prune and dark chocolate flavours going through to the incredibly long finish. This is a fine wine, beautifully made and very polished, everybody was impressed and I didn’t want the bottle to finish – 93/100 points. Available in the US, click here for stockist information. 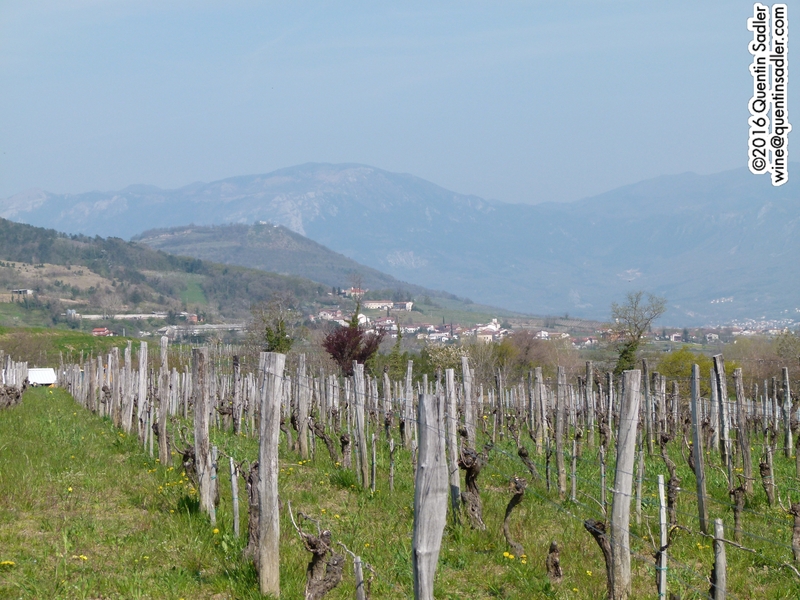 I was very taken with the Vipava Valley. It is a beautiful rural landscape and is home to a bunch of dedicated winemakers who use the sub-Mediterranean climate together with the cooling winds that rip through the valley, to craft some stunning wines. Like most of the country, the wines are mainly white, but there is a little bit of red too. Excitingly the valley is home to two indigenous white grape varieties not found anywhere else, Pinela and Zelen. 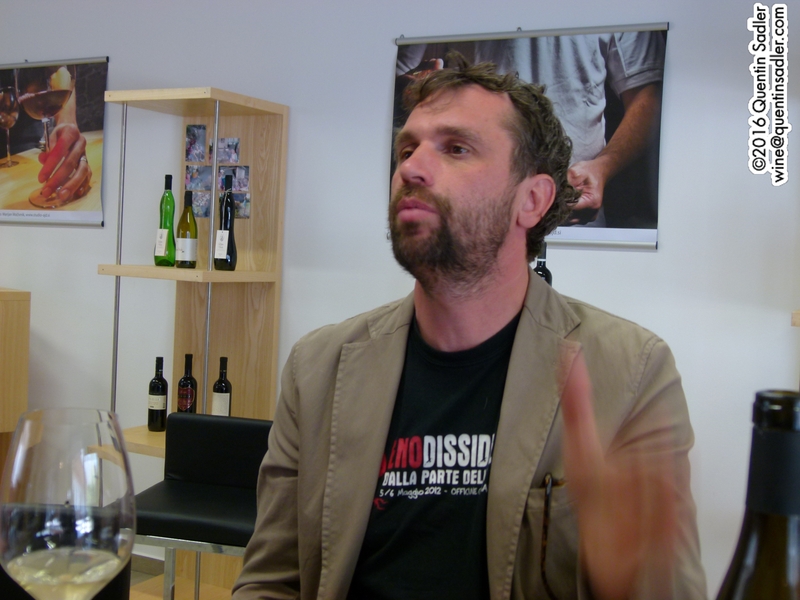 Zmago Petrič of the Guerrilla Estate, on the right, explaining his wines. This is a new estate, created by Zmago Petrič in 2006, but they are really going places. Zmago farms their 7 hectares bio-dynamically and use spontaneous fermentations with the wild yeast. This Pinela is fermented in stainless steel tanks and aged on the lees for 9 months. This lovely wine manages to straddle being both rich and fresh. It has mouthwatering acidity with fresh apple, rich citrus and some creaminess on the palate. This has lovely concentration and focus and it is a lovely, delicious and appetising style of wine that would go with just about anything. I have a hunch it would be great with pesto – 91/100 points. Zmago produces this unusual, to me anyway, blend of 50/50 Merlot and Barbera – Barbera is of course from Piemonte in Italy, but is quite widely used in the Vipava Valley. This wine is fermented in stainless steel to accentuate the fruit and then aged 2 years in 225 litre oak casks. There are savoury aromas here, together with some black fruit and coffee notes. It is a medium bodied wine with soft tannins and lots of red and black fruit, with touches of espresso and cocoa from the oak ageing. There are dried fruit characters too and a distinct note of blackberry. A lovely wine – 89/100 points. Primož Lavrenčič of the Burja Estate. Another small, 6 hectare, estate that is farmed bio-dynamically. Primoz’s family own the well known Sutor Esate , but in 2009 he decided to set out on his own and so created Burja, which is named for the Bora wind that roars down the valley. I was thrilled to try the other local grape, Zelen means green in Slovene. The main white wine of the estate is this blend, which is a very different style. It is a blend of 30% Laski Rizling / Welschriesling, 30% Rebula and ‘other varieties’, I assume some Malvasia, Pinela and Zelen. Fermented in upright wooden casks with 8 days maceration on the skin. Spontaneous fermentation with the wild yeast, 18 months ageing in oak barrels and no filtration. The nose is attractively waxy and smoky with some sweet spices and nuts. The palate is smooth and soft, but mouth filling, with nuts, cream and rich peach together with a seam of fresh grapefruit acidity keeping it all balanced and thrilling. This is very fine, with a long satisfying finish – 93/100 points. These two districts are a little more demanding I find. The wines are very specific to their place and style and they use grape varieties that are often very difficult to tame. In fact the main black grape in these areas is Refošk, which is also widely used over the border in the nearby regions of Italy. Over there it is called Refosco. In the Kras / Karst district Refošk is often called Teran. The main white grape around here, and also very often over the border, is Malvazija, Malvasia in Italy. 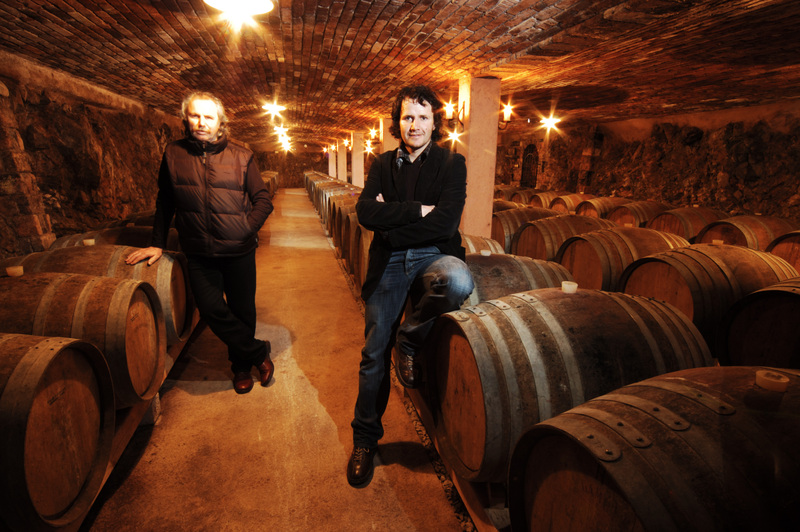 Branko & Vasja Čotar – photo courtesy of the winery. I have long admired the wines of Čotar – pronounced Cho’tar – it is a father and son run winery in the Carst, or Kras in Slovenian, district that is just inland from Trieste. That city, now so obviously Italian was once a principally Slovene city and the principal port of Austria. The Italian Carso district has the same limestone soil riddled with cave systems and underwater rivers and produces similarly fascinating and unruly wines. They are thoroughly European wines with astringent characters and often more minerality than fruit. Branko & Vasja Čotar began making wine for their restaurants in 1974 and slowly winemaking took over. They bottled their first vintage in 1990 and today they farm 7 hectares in this harsh limestone landscape that has an iron-rich topsoil. They grow Refosco, Cabernet Sauvignon, Merlot, Malvasia, Sauvignon Blanc, Vitovska, or Vitovska Grganja or Garganja which is a local white grape. All the farming is organic, the fermentations spontaneous and they use as little sulphur as possible. In my experience they make a stunning Cabernet Sauvignon. This wine is a sparkling red Refošk, which is not to everyone’s taste, but I love red sparklers. Rich and refreshing, as you drink them cold and serve them with fatty meat dishes. The base wine spent 3 years in big wooden vats and the finished wine spent 12 months on the lees, but was never disgorged. The lees remain in the bottle. The froth is lovely, a bright deep blackberry crush and raspberry colour. The nose is forest floor and smoke from the oak, as well as dried fruits of the forest. The palate is rich and fresh with lots of blackberry and spice. An acquired taste, but a good one I think – 89/100 points. This is an amazing wine. I do have to admit that there was some bottle variation, but the best ones were wonderful. It is a blend of 40% Teran, 40% Merlot and 20% Cabernet Sauvignon. A wild yeast fermentation in open wooden vats, no added sulphur and long maturation in 6 year old barrels. It is unfined and unfiltered. There was plenty of funk on the nose as you might imagine, but loads of freshness and fruit too, plums, blueberries and blackberries, as well as a little dusting of peppery, coffee oak. The palate offers loads of fruit all mixed up, plums, raspberries and blackberries, as well as spice, herbs and espresso tones. The finish is long and satisfying, but the wine cries out for slow roast lamb or suckling pig – 92/100 points. The 2005 is available in the UK for #22.50 from VinCognito. The view from the Polič Estate towards the sea. Photo courtesy of the winery. Polič Estate terrace by night. Photo courtesy of the winery. This is yet another new winery and once again everything is organic and biodynamic. This is only the second vintage and Neja and Peter Polič could not have chosen a more wonderful spot to build his winery. It is in the hills looking down at Slovenia’s short stretch of coast with the city port of Koper and the beautiful seaside town of Piran in the distance. Strictly speaking this wine would be a ZGP / PDO Koper, but Peter keeps to the looser rules of the PGI Slovenska Istra, which is the same as Vin de Pays. He only grows 3 things, Refošk, Malvazija and olives. I have only tasted the red and I was very impressed. Refošk is a difficult grape to tame. It can appear rustic, old fashioned and lacking in charm to someone not used to it. Not this one. Everyone loved its stylish character. It’s unusual too, but in a good way. The wine was aged in French barriques for 7 months. The nose gives rich blackcurrant fruit together with prunes, malt loaf, chocolate and raisins. The tannins are smooth and velvety while it gives flavours of rich bitter cherry and cherry stones, more chocolate and kirsch. There is plenty of acidity, earthy, herbal Mediterranean flavours and a long, fresh finish. A wonderful take on a grape that I often find hard to love, I did love this. Drink it with Mediterranean food, even a little bit chilled – 91/100 points. Traditionaly this region is known as Goriška Brda after the local capital of Gorizia, which was awarded to Italy in 1947, so Tito’s regime built the replacement town of Nova Gorica right on the border. Strictly speaking Brda is a sub-region, or district, of the Primorje wine region. This means by the sea and the whole place enjoys a broadly Mediterranean climate. The sheer range of wines produced in Brda is quite bewildering, especially when you realise that the estates are all pretty small, normally between 4 and 20 hectares in size, many with vineyards on both sides of the border. Aleš Kristančič in full flow on the terrace at Movia. 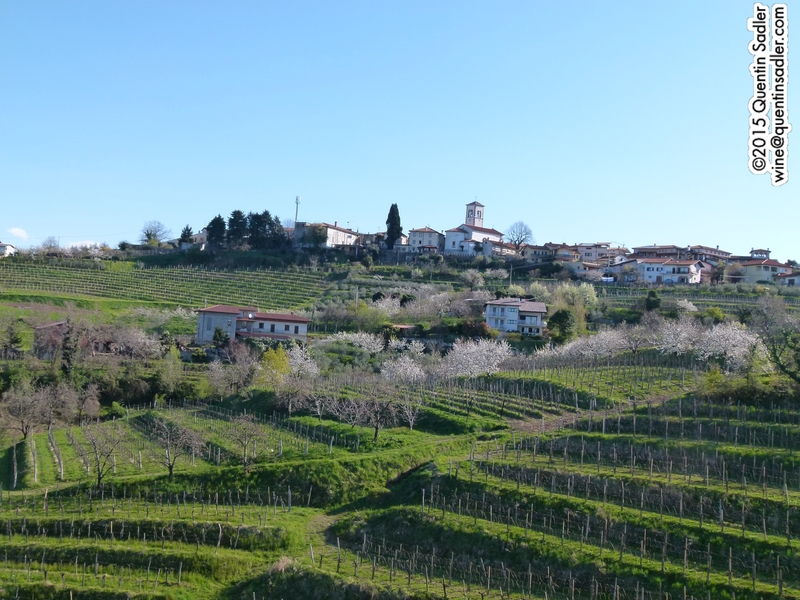 Movia was the first estate that I visited in Slovenia, back in 2002 and it was a total revelation – I wrote about the visit here. I thought the wines were amazingly good then and I do now as well, but they have got a lot more quirky in recent years. Movia has belonged to the same family since 1820, eight generations of winemakers so far, and has long been the most famous producer in Slovenia. Since Aleš Kristančič took over from his father – also Aleš – a few years ago he has taken the estate in a new direction, towards natural wines. It isn’t a big estate, just 15 hectares – 7 of which are actually over the border in Italy – you can spit over the frontier from the winery terrace, but it is now farmed organically and bio-dynamically. 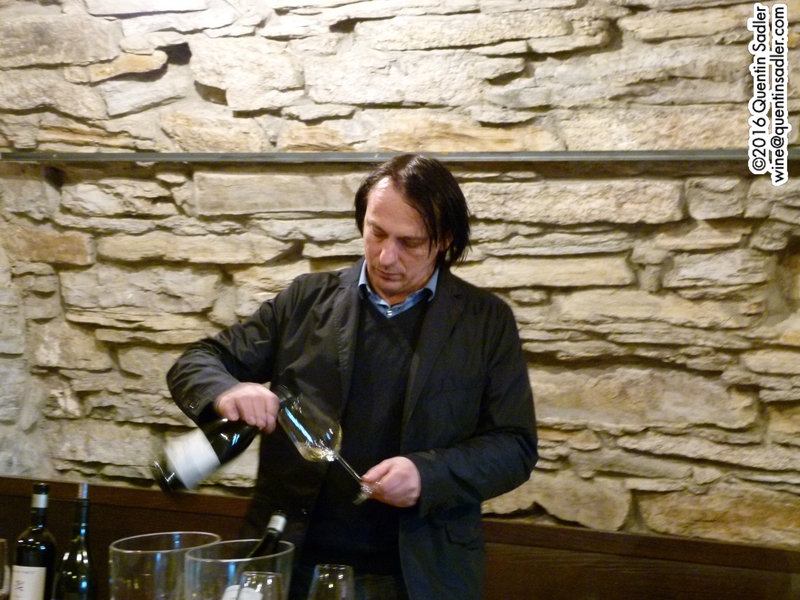 The passion, some might say manic exuberance with which Aleš assaults everything, really shines through in his wines. Like him they have something to say and have a vital energy about them. 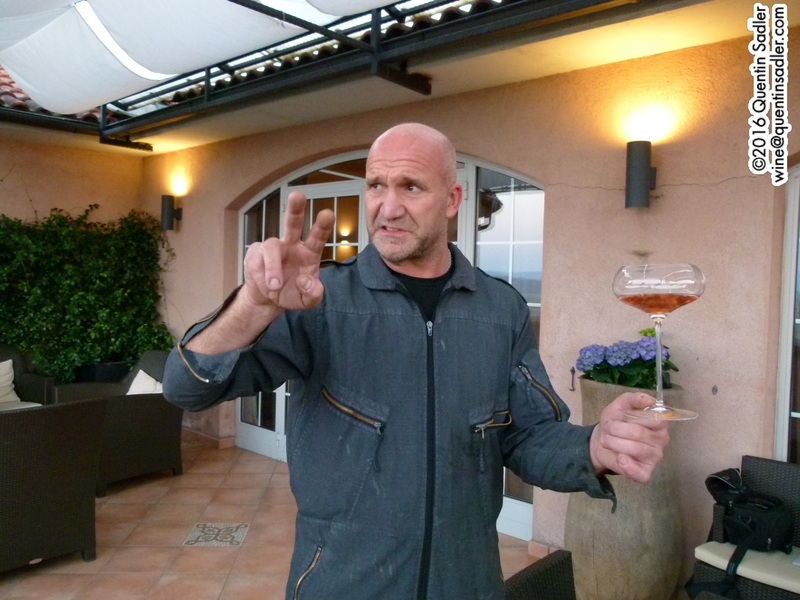 He is a dedicated winemaker with great attention to detail and all his wines are good, many are astonishing. There are three things that I generally don’t like, Pinot Grigio, Natural Wine and Orange Wine – these are white wines fermented on their skins like a red wine – and this is all three in one! And what do you know, I loved it. It was fermented in barrels on the skins, with no added sulphur or yeast and then aged for 18 months in oak – they like oak at Movia, but the wines hardly ever seem oaky as they leave it in the wood for so long that the flavours seem to fall away again, or so they tell me. The colour is a rich apricot, while the nose has aromas of peach skin, red apple and dried apricots, there’s some orange peel notes together with ripe melon and something salty and gently smoky like ham. The palate is a beguiling mix of fresh, rich and salty / savoury with a deep core of sweet ripe, dried fruit and lots of minerality too. The finish is long and the wine is rather moreish, which is a shame as I have none left. A great wine, that shows what you can do with Pinot Grigio, but it isn’t for everyone – 92/100 points. Available in the UK for around £14 a bottle from Meadowvale Wines. Marjan Simčič, the quiet winemaker of Brda. Just a stroll away from Movia, you come to Marjan Simčič’s winery and Marian could not be more different from his neighbour. Where Aleš Kristančič is loud and gregarious and turns every tasting into a karaoke party, Marjan is quiet and unassuming. And yet he is equally passionate about his wines and it shows too. Again this is not a big estate, just 18 hectares that the family have tended since around 1860 and again half of them are in Italy. 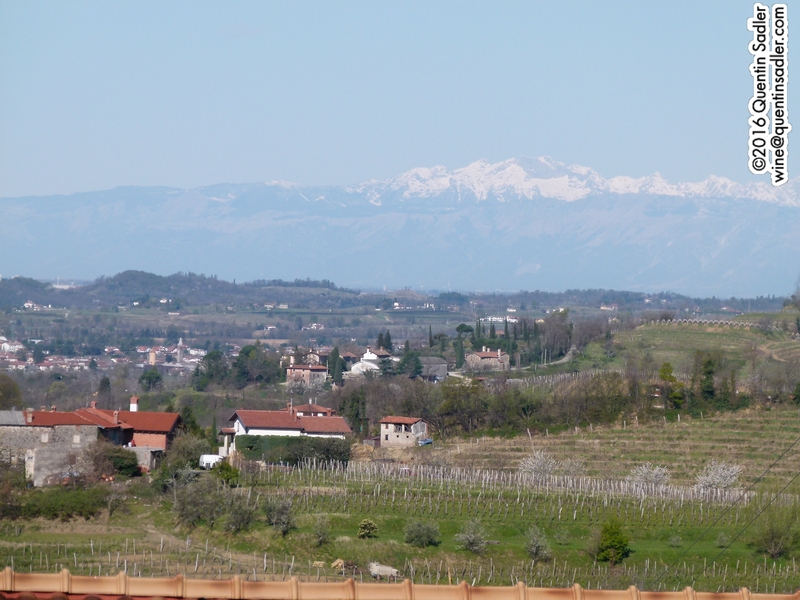 Until 1947 Brda and Collio were the same region, the words both mean hill in their respective languages. Marian farms organically and bio-dynamically and does not fine or filter his wines and only uses the natural yeasts. Barrel fermented Sauvignon aged in cask for 24 months, so again not to everyone’s taste, but this is a great wine none the less. There is a real polish to this wine, you can tell that it’s good as you drink it. The oak and the lees ageing and the spontaneous fermentation have all worked together to make this a richly textured wine. There is fresh acidity there, but it still feels fat, there is varietal character too with that rich blackcurrant leaf note. The palate feels pristine and beautifully balanced and it is very rich with a silky texture. If you like good white Bordeaux, then this is for you. I would love to try it with a sole – 93/100 points. Available in the UK from Bancroft Wines. This Pinot was fermented in stainless steel tanks with a long skin maceration and then aged for 28 months in French oak vats. The nose is wild and intoxicating, possibly from the wild yeast, light smoke and coffee and cedar as well as a touch of kirsch and even a twist of orange peel. It is wonderfully concentrated with rich, ripe cherry fruit, smooth, velvety tannins and a plump, sumptuous feel to the palate. Nothing like a Burgundy, but a magnificent wine – 94/100 points. Available in the UK for around £30 a bottle from Bancroft Wines, Hedonism Wines, Red Squirrel and Slurp. The reason for writing this was to pass on the fact that lots of people really enjoyed these wines when I showed them in recent tastings. In fact they found them exciting. There was such variety, everything in fact from brisk, pure white varietals, to fine white blends, natural wines and complex long aged reds. There was winemaking and grape growing of the highest order – most of these wines were made in the vineyard and not the winery – there was passion, there was ambition and above all there was joy. These were wines that could really be enjoyed and isn’t that what it’s all about? So the next time you are feeling adventurous, try some Slovenian wine. I can guarantee that you will enjoy it. A little while ago I was lucky enough to have a fabulous trip around most of Austria’s wine regions. I was pretty excited about it as I had long wanted to get a real look at this resurgent wine producing country. Personally I have always been drawn to the Austrian / Central European culture and have always enjoyed the food and the beer and liked the look of this part of the world. So, I was looking forward to getting better acquainted with it as well as seeing the wine regions and meeting many of the important winemakers. For reasons of economy I flew in through Bratislava, which is very close to Vienna and was for hundreds of years the Imperial Austrian city of Pressburg or Preßburg. I didn’t have time for a meal, unusually for me I didn’t have the inclination either as I knew my plans for later that evening in Vienna, so I grabbed a sandwich and a beer at the airport. I was already somewhere interesting when something as a simple ham and cheese sandwich bore no relation to its counterparts at home. It came on black bread with smoky Black Forest ham, rich cream cheese, loads of pickles and was delicious. The beer too was far better than such a simple thing as a lager would normally be in my life, it had a rich hoppy character and a depth of flavour that would astonish most members of CAMRA. Arriving in Vienna for the first time in 27 years I strolled around this grand city trying out some of the wonderful coffee houses and cafés for which the place is justly famous. It seemed as though almost every building housed a cake shop – do they really eat that much cake I wondered? Watching the Viennese at play over the course of the evening it seemed that they really did – and later I joined them myself. Dinner that night was a sort of pilgrimage for me. All my life I have been excited by schnitzels – I know it sounds strange, it even looks odd to me now I have actually typed the words, which is akin to saying them out loud. Hell, it’s cheaper than therapy! I am always drawn to schnitzel on a menu though, even if there is finer fare to be had. 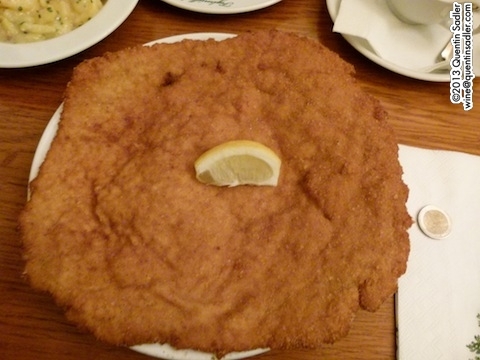 I have this theory that schnitzel is the best dish in the world – no not a theory, a belief! So I went to the place where the schnitzel began. The Wiener Schnitzel is a classic dish, but it seems that no one can actually find much of a history for it. I remember reading that General Joseph Radetzky von Radetz – he of the march / waltz fame – was supposed to have brought it back to Austria after campaigning in Lombardy and Milan. A Milanese Cutlet / Cotoletta alla Milanese is superficially similar and the Austrians were supposed to have refined it by bashing the meat out to tenderise it and make it very thin. Sadly it seems that this is a myth though and no one knows exactly where it came from or when. Wiener Schnitzel at Figlmüller alongside a €2 to compare the sizes. In Vienna there is a restaurant called Figlmüller that not only claims to have invented the schnitzel, but to have done so as recently as 1905. I find that extraordinary as 1905 is only just beyond living memory, my grandfather was 20 and my own parents births were only 22 years away. How can something so famous and so universal be that recent? Anyway I went and had a most excellent Wiener Schnitzel washed down with a rather splendid beer and copious amounts of Grüner Veltliner from the restaurants’ own vineyards. For desert I visited the Café Sacher inthe world famous Hotel Sacher, which makes probably the most famous chocolate cake in the world. I felt that at least once in my life I should try the original in the actual place that gave the world the sachertorte. The café is rather lovely with genuine old world charm, open till midnight and serves a stunning red Zweigelt Beerenauslese, from Weingut Kracher in Burgenland, which is absolutely perfect with a slice of sachertorte – a better match than coffee actually. Having immersed myself in the most famous, possibly clichéd, but certainly delicious, aspects of Austria’s gastronomic culture, the next morning I felt ready to explore her wines. 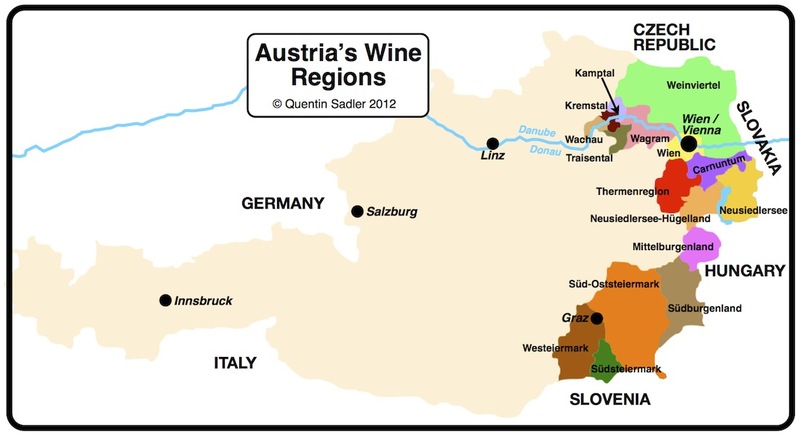 Austria’s wine regions – click for a larger view. The start of my trip was billed as a vineyard rally through Leithaberg and Neusiedlersee. 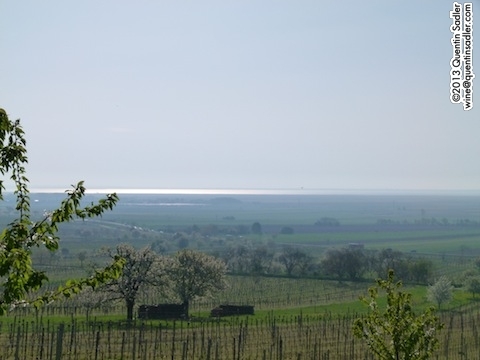 Of course with my new found instant knowledge I knew that Leithaberg was a Districtus Austriae Controllatus / D.A.C wine region near Eisenstadt that covered the lower reaches of the Leithaberg mountain and faced south east towards the beautiful lake called Neusiedlersee. Despite sounding mysterious, the vineyard rally turned out to be simplicity itself, no hard hat or special training was required. We were taken to two different spots in the surrounding vineyards to meet some winemakers and taste their wines. Our first stop was right in the middle of the vines with barely a building insight – other than church towers in the far, far distance. The weather was warm with clear blue skies and the spot stunningly beautiful with that feeling of total peace that I associate more with vineyards than anywhere else. Spying a falcon in flight just added to the feeling of being somewhere special. There we were met by the impossibly youthful looking Leo Sommer who was representing Weingut Sommer, the winery his family have run since 1698. Leo had set up a tasting for us right where the slope stopped at the foot of a rocky ridge. Looking one way I saw the vineyards sloping gently down towards the lake that shimmered enticingly in the distance. In the other direction the land became much steeper with fewer vineyards. The Sommers farm 30 hectares here and they aim to capture the essence of the place in their wines. 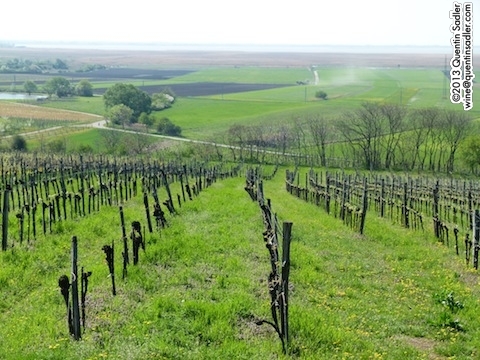 The summer here is hot and dry, with ripening helped by the warm winds blowing in from Hungary’s Pannonian plain. The nearby lake though manages to temper and balance that heat in the height of summer, while helping to keep the autumn cold at bay during the later part of the ripening season. This is the important Altweibersommer or Indian Summer that allows them to harvest very late in this area. Looking away from the lake you can see how the slope changes. We had our tasting by the van. A close up of the same scene. White Leithaberg D.A.C. wines can be made from Pinot Blanc / Weißburgunder, Chardonnay, Neuburger, Grüner Veltliner or a blend of any of these and we tasted two of the Sommer’s Grüner Veltliners. One had some oak with lees stirring, while the other was all stainless steel, yet they both summed this place up to my mind. To different degrees they both had a richly textured ripeness leading to a taut, stony mineral finish and when looking around this glorious sun drenched landscape with its sandy loam and slate soils, it struck me – this was precisely what these slopes should produce. In many ways standing here felt as though I was in a little protected pocket by other less forgiving climates – much like Alsace or Central Otago. The more I thought about that when we visited all the different regions the more I realised that is exactly what the Austrian wine regions are – mountains and more extreme weather dominate the rest of the country – we often glimpsed snow-capped ridges , so these places in the far east of Austria are an oasis of temperate growing conditions. Our next port of call reinforced this view. This time we were nearer the lake, right at the bottom of the gentle slope before the flat land that surrounds the Neusiedlersee and our hosts were Martin Palser and Birgit Braunstein, a married couple who just happen to both be winemakers and each runs their own winery. Down here it seems there is much more limestone and Martin grows Chardonnay on this soil, which makes his take on the Leithaberg D.A.C. very different from Leo Sommer’s wines. His 2011 Chardonnay Reserve impressed me very much with its lovely balance, very Burgundian character and pronounced minerality – I know, I know – and Martin told us that this minerality was the character of the place and was more important than grape variety in his opinion. Then Martin handed over to his wife who presented two red wines made from the region’s signature black grape – Blaufränkisch. Red Leithaberg D.A.C. wines must contain at least 85% of this with up to 15% of St. Laurent, Zweigelt or Pinot Noir. I have enjoyed Blaufränkisch before – even as Lemberger in New York’s Finger Lakes, but none have impressed me quite as much as these two made by Brigit Braunstein. Her 2009 Blaufränkisch Reserve Leithaberg D.A.C. was beautifully fruity and balanced with gorgeously ripe fruit together with elegant spice, the delicious cherry-like acidity that I associate with the grape – and a streak of pure minerality. Somehow the wine managed to keep quiet about the 18 months it had spent in new oak and was superbly integrated. Standing on their terrace looking across the vineyards to the lake I was struck by the place, conditions and landscape and how they seemed to echo the wines that I had just tasted. The breezes blew the otherwise searing heat away – “air conditioning for the vines” as Martin put it – and these are ripe, cool climate wines. They are keen on biodiversity here and the fields were a colourful riot of cherry trees, wildflowers, grasses and herbs as covercrop between and around the vines, while the sandy loam soil, slate and limestone that it all grows in is key here. The defining characteristic of Leithaberg D.A.C. seems to be the minerality and I felt that it was all around me as well as being in the glass. All in all it was an excellent beginning to the day, I felt peaceful, invigorated, more experienced and better informed and it wasn’t yet 11 o’clock. Funny things wine trips. You live in close proximity to people you barely see the rest of your life, you lose all track of time and get dragged from one place to the next at breakneck speed with barely a backward glance – until you start writing anyway. You get given far more meals in a day than is strictly required – and sadly get to like them. What does stand out though, what makes all the suffering (really?) 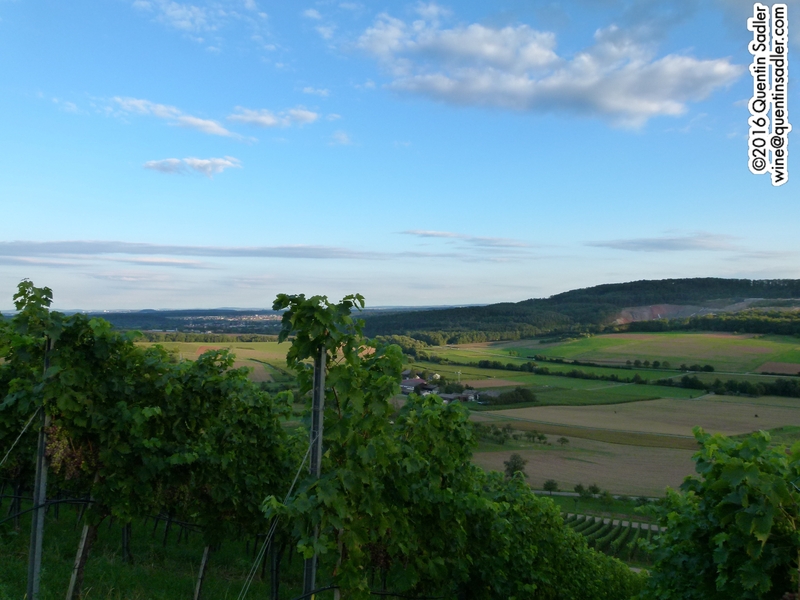 worthwhile is when we visit somewhere that touches the heart and a good few of the visits on this Austrian trip did just that, but one of the most memorable was to Weingut Birgit Eichinger. There aren’t many women winemakers in Austria, so Brigit Eichinger is pretty unnusual – strangely the only other one we met was also called Birgit, Birgit Braunstein – what’s more Birgit Eichinger and her builder husband Christian have only been running their estate since 1992 when they started with 3.5 hectares. The winery was built in 1994 and they have been adding vineyards when they can and today they farm some 15 hectares in Strass. Strass is in Kamptal which in turn is part of Niederösterreich, which is in many ways the heartland of Austrian wine as it includes the famous regions of Wachau, Kremstal and Wagram amongst many others and so certainly defines my view of Austrian wine – the whites anyway. Site matters here as there is no one single terroir. 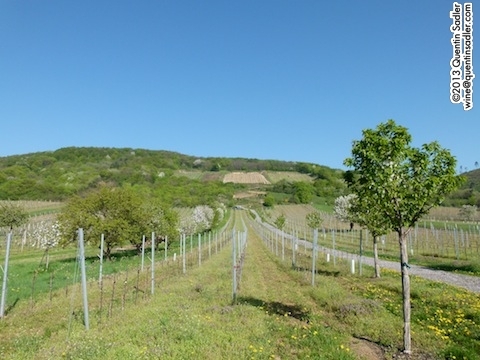 Many of the vineyards have loess over gravel and loam, but others have sandstone, slate and schist, so as in Alsace matching the grape variety to the site makes real differences to the wine. There is even volcanic rock on the Heiligenstein slope from where Birgit produces a stunning, spicy, pure and intensely mineral Riesling. To qualify as Kamptal D.A.C. a wine must be made from Grüner Veltliner or Riesling, so Birgit’s deliciously floral and exotic Roter Veltliner – also known as the Roter Muskateller and no relation to Grüner at all – and her Chardonnay are simply labelled as coming from the wider area of Niederösterreich. The landscape here is spectacularly beautiful – actually everywhere we went was – with the terraced vineyards cascading down the slopes towards the small town of Strass where Birgit’s winery sits at the foot of the Gaisberg slope. All the wines were superb and I know that many of us would have purchased a few bottles if we had had the space in our luggage. The Rieslings and Grüner Veltliners in particular showed their class with a concentration and yet lightness of touch that gave them a feeling of tension and sophistication that certainly brought a smile to my face. 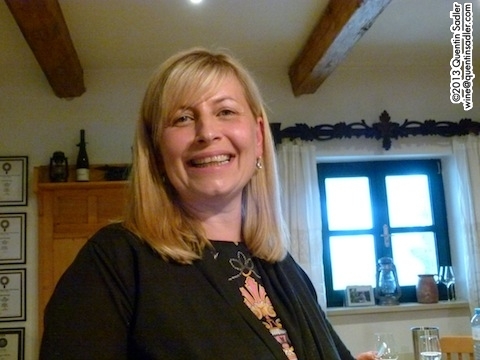 Birgit’s beautiful wines are available in the UK from John Armit Wines and in the US through Weygandt-Metzler Importing for other teritories check here. The whole trip was a delight – apart from being locked out of my hotel room and two of my colleagues missing their flights – and my enthusiasm for the country and its wines has been totally rekindled. I will write about some of the other places I visited and wines I tasted in Austria soon. If Austrian wines have passed you by then you really do owe it to yourself to give them a go. There is a great deal of pleasure to be had by exploring the wines of Austria.